Finding a FODMAP-friendly chicken broth can be a real challenge. But you don’t need to panic! This low FODMAP chicken broth is easy to make and freezer-friendly so you can easily keep it on hand. When I started the Low FODMAP Diet, finding low FODMAP chicken broth was a huge problem! 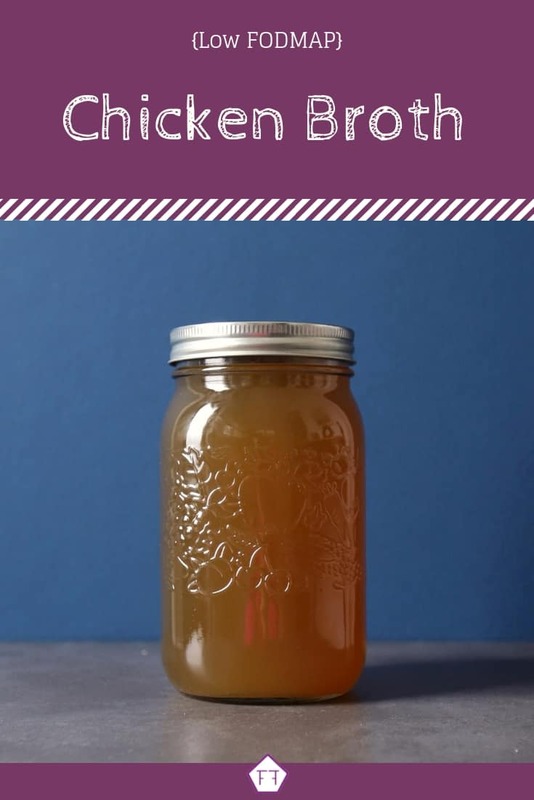 I had never made my own broth before, so I was at a bit of a loss when I couldn’t find a low FODMAP brand at my local store. For my Canadian peeps, Campbell’s and GoBio chicken broth are both low FODMAP. If you can’t find these brands at your local store, this low FODMAP chicken broth is an easy way to keep this pantry staple on hand. Think this low FODMAP chicken broth sounds great, but you don’t have time to try it now? Don’t worry, you can PIN THIS POST for later! This low FODMAP chicken broth is an easy way to add a classic flavour to your favourite dishes. Check out the notes below for tips on keeping this recipe FODMAP-friendly. First, the star of this recipe is chicken. Since chicken is a protein, it doesn’t have any FODMAPs. That means it won’t add to your overall FODMAP load. This recipe also uses carrots. According to the Monash app, carrots don’t have any detectable FODMAPs. This means you can eat as many as you want and they won’t add to your FODMAP load. Last but not least, are leeks. According to the Monash app, the green part of a leek is low FODMAP in servings of 2/3 of a cup per sitting. Servings of 1 cup or more are high in the polyol mannitol. Our recipe uses 1 cup of leeks total. This works out to 2.6 tbsp of leeks per cup. Even if you drink the broth on its own, this is well within the recommended range. Want to try this low FODMAP chicken broth? Don’t forget to PIN THIS RECIPE for later! 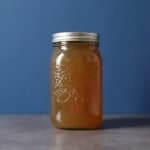 Looking for a low FODMAP chicken broth? This quick and easy recipe is the perfect way to keep this pantry staple at your fingertips! Combine all ingredients in your slow cooker and cook on low for 7-8 hours. Let the broth cool and strain it into a container. Homemade stocks last for 2-3 days in the fridge. So, stick what you need in the refrigerator in an airtight container and stick the rest directly in the freezer for safe keeping. 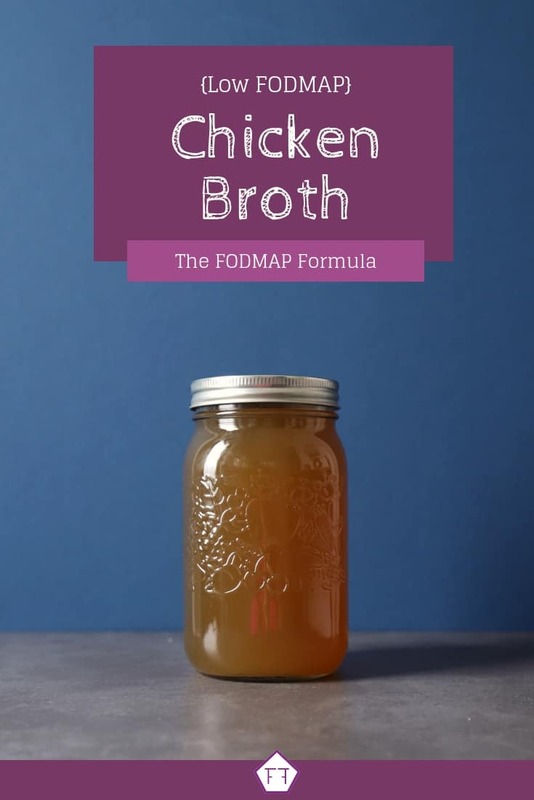 This low FODMAP chicken broth is the perfect way to keep this pantry staple at your fingertips! If you like this recipe, don’t forget to share it! Together we’ll get the Low FODMAP Diet down to a science! Low FODMAP Quinoa Stuffing Looking for a low FODMAP stuffing recipe? You’ll be craving this easy quinoa stuffing all year long! Low FODMAP Gravy Looking for a FODMAP-friendly gravy recipe? This classic recipe just got a low FODMAP twist your whole family will love! Low FODMAP Short Rib Beef Stew Looking for a savoury make-ahead dinner idea? Made with savoury low FODMAP beef stock and seasonal root vegetables, this hearty stew is the perfect way to end a chilly day! I’m a fellow Canadian with a son recently diagnosed with IBS. Looking to make this recipe today as buying Low fodmap broth can be expensive with the quantities we use. I have purchased Imagine bone broth as well as Go Bio in the past but am surprized that you mention Campbells as I haven’t come across any Campbells that didn’t have garlic and onion in them. Is there a specific product that they make that is Low Fodmap that I’m not aware of? If so I certainly will keep a look out for sales. Campbell’s 30% less salt and Campbell’s no salt added chicken broths are both low FODMAP. Campbell’s has confirmed they label onions and garlic separately from “spices” or “natural flavours,” so you can use their products if you don’t see any high FODMAP ingredients listed on the label. You’re right, though. It’s definitely cheaper in the long run to make your own!